We’ve all had those days.. you come home from work or school, and the only think you want to do is throw yourself on the sofa and relax. Then it’s either the hunger kicks in or in my case, your spouse or kid start complaining about being hungry. This is when this recipe comes in handy. 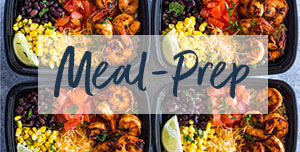 It’s super simple and easy to make and can be prepared ahead of time. The whole family loves quesdillas because they are so freaking amazing!! I love adding a lots of cheese and kicking it off with a plain and simple sour cream dip to balance out the savory flavor. It’s times like this that I appreciate having lived in Sunset Park Brooklyn because I was exposed to the wonderful Mexican cuisine. For those of you that aren’t from NY, Sunset Park is basically like “little Mexico” in the heart of Brooklyn. It’s about 30 blocks wide and runs along 5th ave. It’s filled with tons authentic Mexican restaurants and taco spots. I remember my first week there I tried over 10 taco places out of the excitement! These quesadillas are super easy to make because all you have to do is mix all the ingredients in one big bowl and place into the quesadilla. 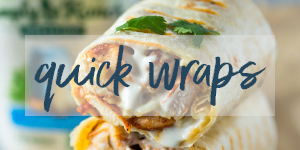 I usually prepare the mixture ahead of time and have it in the fridge so that when I need it, I can just scoop some chicken mixture and have a quesadilla ready in just a few minutes. 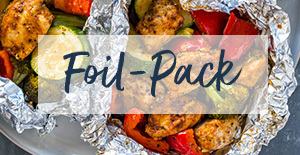 This recipe can also be used with BBQ sauce or no sauce at all if preferred. Your going to need some cooked shredded chicken for the filling, I usually use any kind of leftover chicken I have in the fridge. 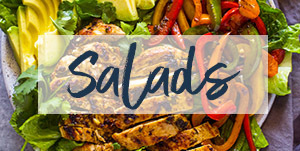 Leftover rotisserie chicken works great with this! 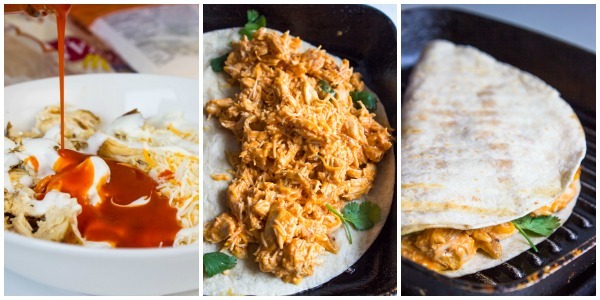 Heat skillet to medium heat, In a small bowl, toss chicken, buffalo sauce, ranch, cheese, salt & pepper, and cilantro. Lightly grease pan with olive, Place tortilla on pan, top with 1/4 of chicken mixture and fold in half. Allow to cook for 2 minutes and flip for 2 minutes on the other side. Remove from heat and repeat the process for all four tortillas. 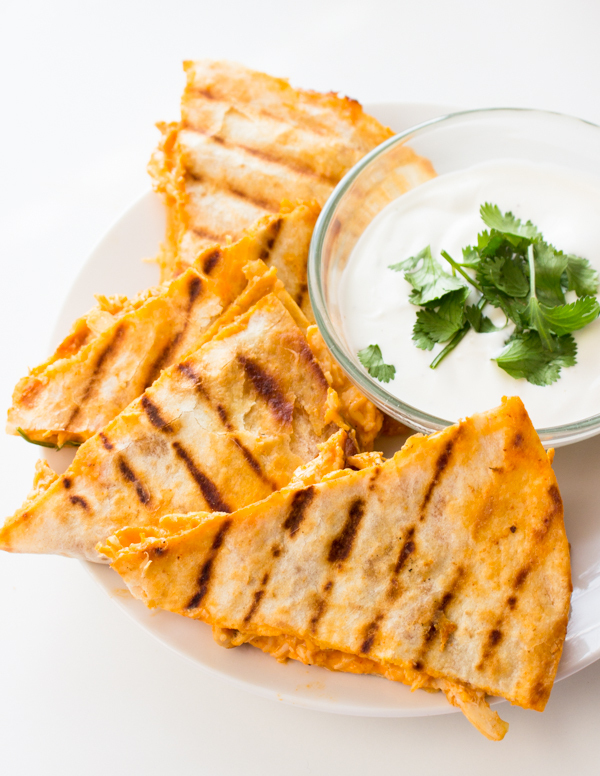 Cut each quesadillas into 4 portions, makes 16 slices. 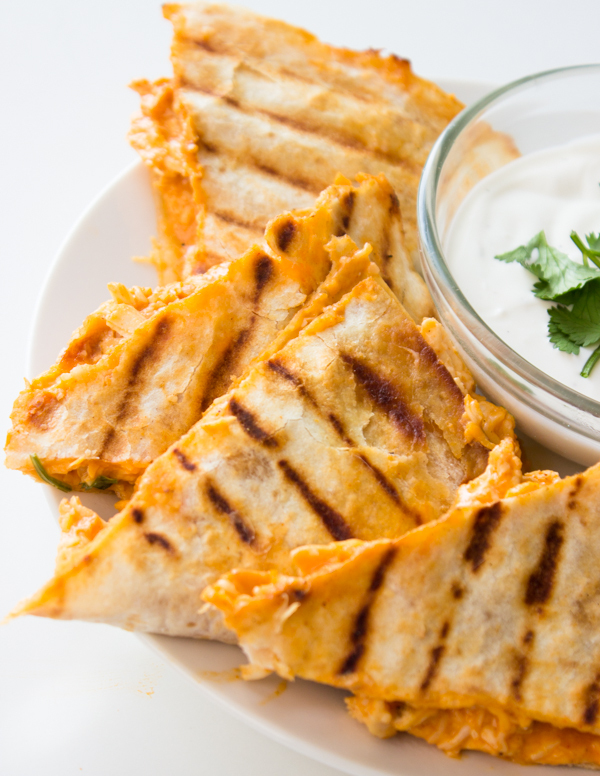 In a small bowl, mix sour cream, garnish with cilantro and serve with the quesadillas as a dip. 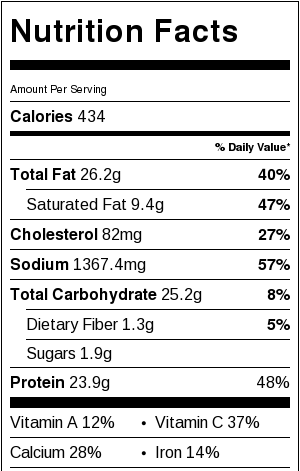 What would be a good sidedish to serve with these? Any idea if I can prepare some of the and store them in the fridge for a few days? I made these and used hot sauce instead of wing sauce, and a few tablespoons of fat free plain yogurt instead of ranch dressing. They came out really great! Thank you for this idea! This was a wonderful recipe – very tasty! The only adjutment I would make is to thicken the sauce a bit – but that is a preference for me. This is definately worth trying – Wonderful! yum! 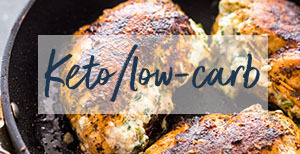 this looks delicious giving this recipe a try now. thanks for sharing..
My husband and I made these for dinner tonight. They were easy and so delicious! Thanks so much for sharing! Jill-I’m so glad you and your husband enjoyed them! Made this for my hunnie last night and it was absolutely DElish!!!! 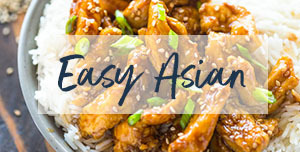 I made these for dinner tonight, and they were so good! Pretty easy, too. Thanks for the recipe. 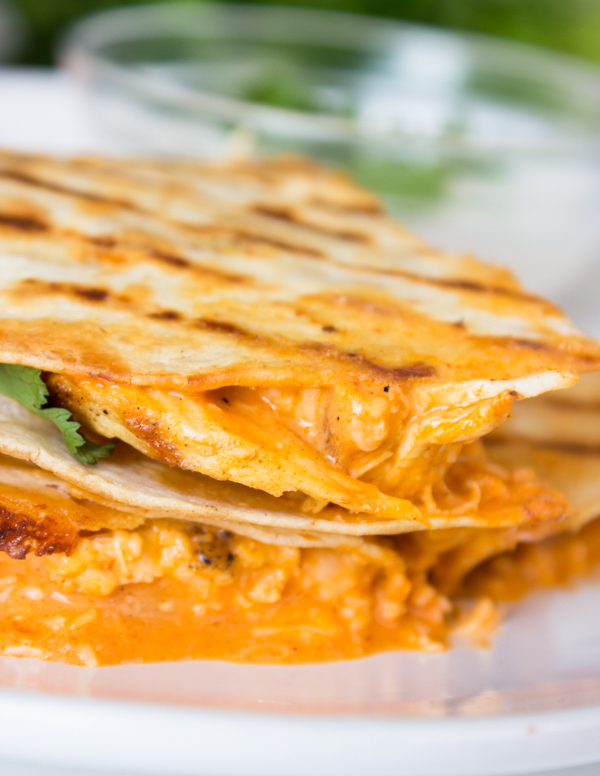 I lived on quesadillas throughout high school summers…they are so fast and easy, and warm sandwich beats cold one any day! 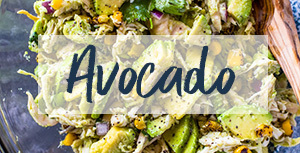 I love your idea of making a creative filling ahead of time…right now my husband and I are on opposite schedules and finding time and motivation to cook with a toddler can be a little difficult. This should do the trick! Like I said before, I really love your blog and your recipe. This recipe and amazing, but the pictures are gorgeous. 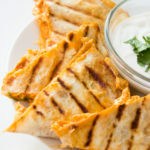 Quesadilla! I’m in love 🙂 These ones are perfectly grilled… I’m so craving these right now! Quesadillas are the best. 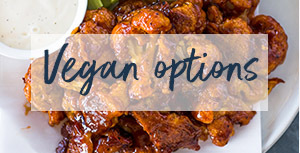 And love that you used buffalo sauce! Kelly, Glad you liked them! 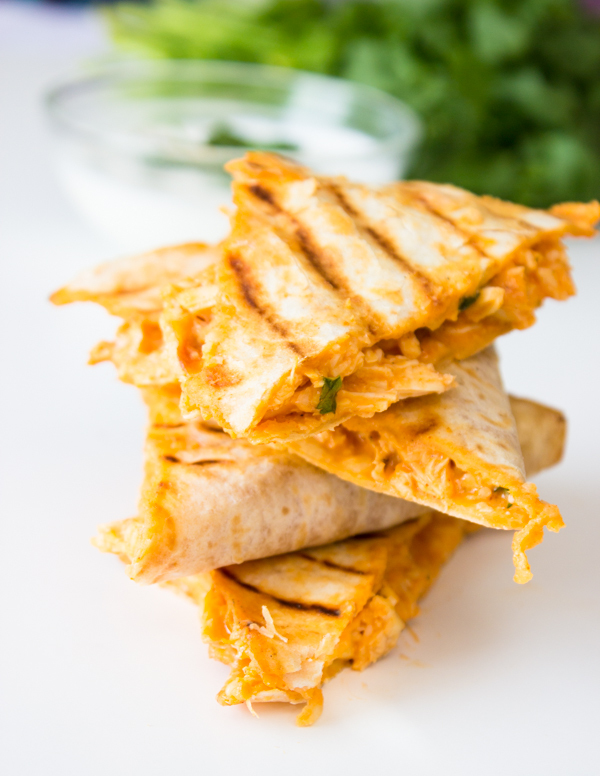 We love Buffalo Chicken too and it’s even better in quesadillas!